Note: this feature is available in the Pro edition only. The Multiband Compressor splits the audio signal in three frequency bands, and applies compression to each band. It is typically used in the Master section when a single band compressor can't provide the amount of compression required without introducing side effects like a loud kick drum noticably muting high frequency parts. 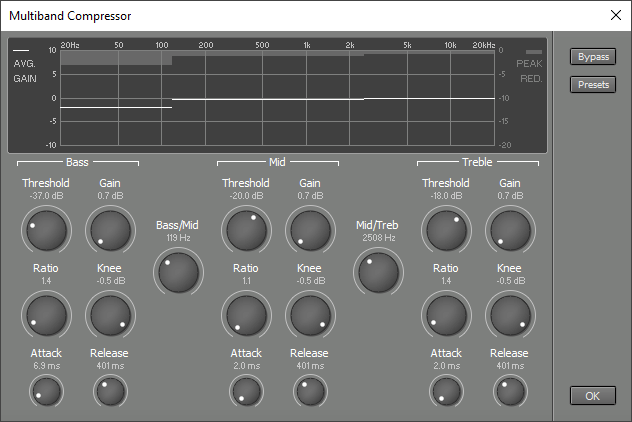 Threshold controls the level above which compression takes place. Gain sets the amount of gain applied after the compressing action is done. As the compressor attenuates loud parts the overall level drops. The Gain control compensates for this level drop. Ratio and Knee control the shape of the compression curve. Low Ratio settings and relatively low Treshold settings are typically used for mastering purposes. The display shows the average gain (including the Gain knobs) as a solid line. If you want to apply compression without changing the frequency spectrum significantly you can use the Gain knobs to make each band's average gain approximately 0 dB. The bars at the top of the display represent the peak reduction (not including the Gain knobs).